Anticipation and excitement are building as horsemen and the racing team make the final preparations for the 2018 Fall/Winter meet at Hollywood Gaming at Mahoning Valley Race Course, which begins on Friday, October 26. After a record setting 2018 Winter/Spring meet for handle, attendance, and field size, expectations have never been higher. A solid daily purse structure of $120,000, (25% increase in just two years) along with a Stakes schedule that is highlighted by the $250,000 Steel Valley Sprint (increased $50,000 this year) has led to a backstretch that is filled to capacity. Over 1,800 applications were received for the 988 available stalls on the Hollywood Gaming at Mahoning Valley Race Course backstretch. Mark Loewe, Vice-President of Ohio Racing Operations for Penn Gaming stated “The $250,000 Steel Valley Sprint, which is part of the Penn Gaming Racing Challenge will be run on Monday, November 19th, as will the $75,000 Mahoning Distaff. Trainers based in the Midwest and northeast have already inquired about the two stakes and we are looking forward to bringing some of the top sprinters to our track.” Nominations for both the Steel Valley and the Mahoning Distaff close on November 5th. New to the weekly production will be Mornings at Mahoning. A behind the scenes glimpse into the business of horse racing that will be offered to the public every Saturday from October 27th until November 17th. Local experts and popular horsemen and jockeys will discuss and demonstrate relevant topics. Coffee and donuts will be available for all fans who RSVP. Space is limited. Please call (330)505-8776 to RSVP. 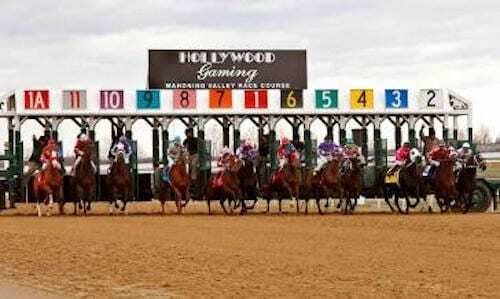 Players are reminded to visit www.hollywoodraces.com, Penn Gaming's online wagering website. Launched in 2016, conveniences and advantages include the ability to make deposits & withdrawals from your account via several options, including on property, along with being able to watch & wager on live races from your PC or mobile device. Featuring many of your favorite racetracks, www.hollywoodraces.com also offers weekly promotions. The 2018 Fall/Winter racing season will feature primarily a four-day-a-week schedule, Monday through Wednesday, and Saturdays with a first post of 12:45 p.m. during the week and 12:15 p.m. on Saturdays. Two Fridays are on the docket including opening day and November 23rd (Black Friday). Both Fridays are scheduled for a 12:45 start. All times are Eastern. Simulcast enthusiasts should mark Breeders Cup weekend on their calendar. On November 2nd and 3rd, watch and wager on the World Championship of Racing from Churchill Downs, in Louisville, KY. This entry was posted in Racing and tagged hollywood gaming, Horse Racing, mahoning, mahoning valley, mark loewe, ohio racing operations, penn gaming, stakes schedule, steel valley sprint by Press Release. Bookmark the permalink.